So this is about a year back from now. I had just got done with studying journalism and am into content-writing, been switching work places here and there, gaining experience and everything. All that was missing was contentment, when you come back from work and feel full. I missed being the carefree me in college, doing random acts of goodness, not for anything else, but for myself, for the feeling it gave me. Of all the things, something I was the surest of was that I never wanted to throw myself in the awkward jungle for the heck of it and be a slave to someone, running behind money. I remember having spent that one month travelling, discovering Lucknow all over again, reading and chilling. Once while sitting with friends and discussing social work, I remember one of them say “You’ve got to follow ProjectKHEL. 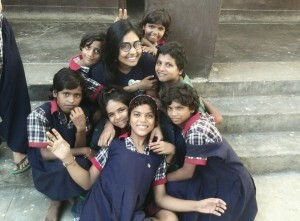 They’ve been doing some brilliant work!” I hadn’t heard someone praise ProjectKHEL for the first time for sure. So, I just had to dig them. I did. I stalk them as much as I could over the internet and write to them, expressing my wish to join them. They were more than welcoming. And, so happened ProjectKHEL. Just about 2 weeks later, I was already in awe of them. Akshai sir, Angana, the rest of the team and oh the kids. They were something. Almost each one of them had something too adorable about him/her. I remember how every time sitting with friends and family, I HAD TO bring ProjectKHEL up. I would just go on and on talking about it, about some little thing or the other that happened at the sessions each day. I loved the fact that they didn’t just claim to be different, they actually were. Having been a part of over 2-3 NGOs before, I knew how they worked. ProjectKHEL had a different sort of a being altogether. They were focused. They wcouldn’tbrag. They knew what they were doing. There was less talking and more of work. And it NEVER got boring. It never felt like work. There’s a thing called Reflect. This is a word you’ll hear a lot. It took me a while to understand it but when it clicked, finally, everything made better sense. I finally am at something that makes me smile and only smile. Helping people truly makes me feel like I am doing something to make this world a better place, even if it is something small. It is these people that don’t just sit around, commenting on things, having a whole lot of discussion on what goes on and just the next moment get over it. They dare to make things happen. They would not just sit on a social networking site, make a black dot their profile picture and be done with it. They would instead be found in some corner of the city, organising a protest march or something. They wouldn’t be participating in random family discussions about how poverty has ruined the country or what a downfall the Uttarakhand or the Kashmir calamity brought to the people around, these people would rather be there, having set up camps, helping people make their way up to normalcy. I’m not saying that it always helps but it is the right thing to do. It is for sure a step ahead and towards the better. You know, I don’t give a damn what the public thinks of Social Workers or what we do, it’s that feeling you will only know when you are on the inside. It isn’t lesser than magic. I fell in love with Social Work the first time I started working with Uday Foundation, a foundation that runs for Cancer kids and Rare Blood Groups and from then onwards, until ProjectKHEL, the love for the profession has only deepened. (Yes, I couldn’t say that less proudly) So, yeah. It took me a good month to properly get to know everybody at ProjectKHEL but I loved the fact how I, like so many of my peers, walked into sessions, and found myself surrounded by people I could relate to, together we found a place where we belonged. We were all labelled, dreamers, do-gooders existing as different individuals outside but when we came together we became something much more. That ProjectKHEL owns. THANK YOU! Also, it isn’t just the environment at ProjectKHEL, but the constant support and presence of like minded people I met that changed my perception on levels, my confidence, and most important of all, my purpose. I now reply with confidence to my father on what I want to do and how confident I am about my decision of getting into social work. Every beneficiary involved gave me a set of memories to bring back home after every session. Considering the fact that ProjectKHEL is taking baby steps their way up, every step involved great amount of honesty. I have ‘n’ number of slow claps to offer when it comes to talking about the beautiful and wide reach that it has. It isn’t just about sports and teaching life skills and grooming. It goes beyond that. I am not at all exaggerating things here. All of this I am pouring right out from my heart because, I am pursuing my Masters in Social Work, and I just haven’t been able to do a lot of sessions with them lately. And that just makes me miss the kids, so much more than I thought. I miss the naïve Rajkiya Baal Grih girls. I miss the fun I would have every session at Gharonda. I miss the notorious lot at Shram Vihar. I miss the crazy-smart and creative girls at LCH. I miss the little sweethearts at Samarth (Also, how Samarth will always hold a special place in my heart for the first session I had was with them), the cuties at Akanksha/ANDA and Pramodini and the winsomely sporty lots of Mamta School and Justice Triveni School. I love them all to bits. Spending the highlighted 3-4 hours of my day, living my best life everyday. Because it’s a lot easier to make a buck than to make a difference. For it lasts and is grand. If you leave at the end of the working day you know you did your best and treated people as you would want to be treated, the job becomes infinitely more rewarding. I am more than obliged to be a part of Project ProjectKHEL, still am, will forever be in as many ways as I could be, but this little thing I’ve written is a token to thank them for existing. You’ve changed me and only for good and have molded a better human being out of me. You’re, in more than one ways, my alter ego.